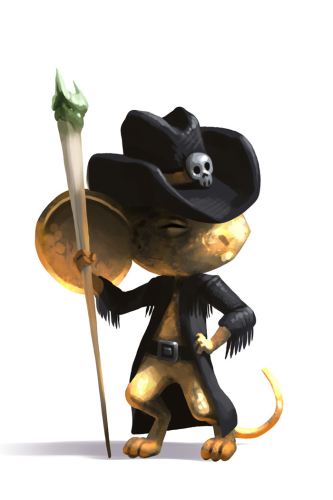 The Pyrite mouse is a breed of mouse found in the Claw Shot City. This tiny mouse lives in the mines near Claw Shot City, and has found a home amongst the strangely cube-shaped minerals. Pyrite, known as "Fool's Gold" to some, is an INCREDIBLY rare element in the Kingdom, much more valuable than common gold. This mouse has learned just how valuable pyrite is and uses the fur on his body to collect and store as much of it as he can. He is rare and elusive, but seems to favour SB+ cheese. Lucky hunters who manage to catch a Pyrite Mouse will find a small fortune of Fool's Gold to call their own! While Pyrite mice can be attracted by standard cheese, they have a distinct preference for SUPER|brie+. Law type traps such as S.L.A.C. are very effective against Pyrite Mouse. This page was last edited on 28 June 2014, at 22:00.